Well look at that! Someone completely botched the month of February. And March. Only 3 comics. Due to taxes, and holidays and finishing up the Life is Pain site. However, check out the progress of this comic I am inking! As you can see, this should have been finished in February, when I started it. I was just scared to ink it. However, it won’t get done if I don’t dive in and make a bunch of mistakes. As Jerzy and Rob and other people I’ve been reading about and listening to keep saying. So I grabbed the following nib and dove in tonight! (it’s a super close-up big picture). 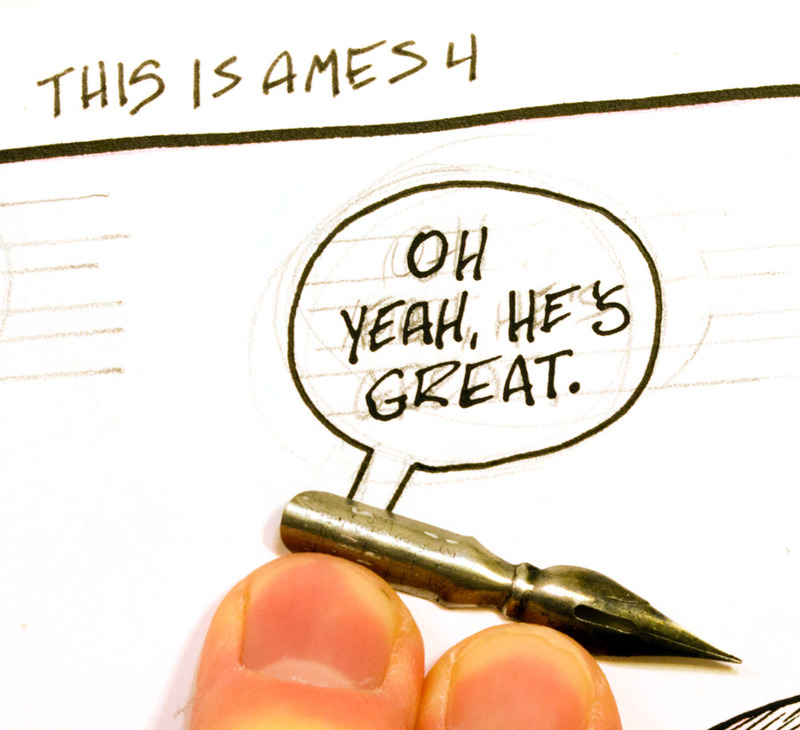 I have a bunch of nibs, but that one seemed good, and the best way to figure out what it’s good for is to just start doing everything with it. So everything in this comic will be inked with it. Fills on the silhouettes were done with a brush because I don’t have all night. And then I used the brush with some Pro White for the hairs in the shadows. Oh, yeah, the word bubble outline and the panel borders were inked with Rapidographs due to their ability to maintain a line with no variance in thickness. The image above is 3-fold in its illustrative capacity: it shows the nib, the letters it inked, and the size of the letters via the Ames Lettering Guide(it’s size 4). It took about an hour-and-a-half just to ink the letters and that first panel. Tomorrow night I hope to finish the rest of it and get back on track for putting out 8 comics a month. 4 for Chronic Malpractice and 4 for Illustrated Thesaurus. What a difference it is to think of, sketch, and ink a stick figure Thesaurus entry in only an hour versus this 3-panel, soon to be 6-hour event. 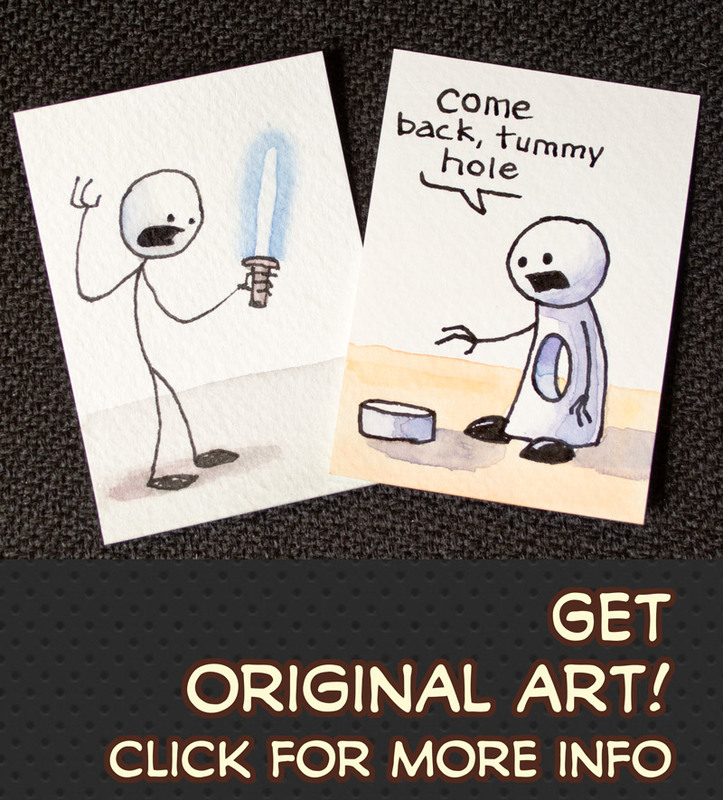 At least if you check this out you get a preview of the comic! 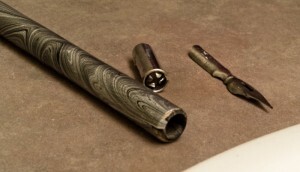 Then, while I was cleaning the pen nib, the whole assembly that holds it inside the handle popped out! Boooo-urns. Not cool. It still works so it’s not that big a deal, but it’s my favorite holder! Look at the fancy swirls! 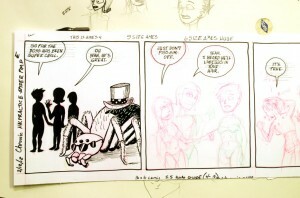 This entry was posted on Monday, April 9th, 2012 at 10:23 pm	and is filed under Comics, Lettering. You can follow any responses to this entry through the RSS 2.0 feed. You can leave a response, or trackback from your own site.